Art on the Underground is a truly excellent project bringing art to passengers across the tube network. "Art on the Underground is a pioneer in commissioning contemporary artworks that enrich the journeys of millions on the Tube every day. 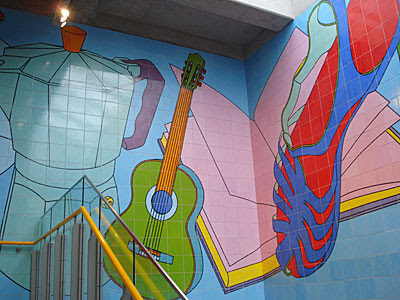 From large-scale commissions at Gloucester Road station to the pocket Tube map cover commissions, Art on the Underground has gathered a roll-call of the best artists over 15 years, maintaining art as a central element of Transport for London’s identity and engaging passengers and staff in a sense of shared ownership." To celebrate a decade and a half of this wide-reaching project, TfL has just launched Art for Everyone, Everyday - a joyous backslap to help remind us all of the good stuff past, and enthuse us for the good stuff yet to come. But in a bit of an own goal, two of the 16 artworks named on the Art Map are no longer on show because they've been replaced by artworks celebrating this new project. So don't go to Stratford to see The Palace That Joan Built, because that was replaced last week by less interesting Art for Everyone, Everyday panels. Ditto don't go to Gloucester Road to enjoy An English Landscape (American Surveillance Base near Harrogate, Yorkshire), because that was also replaced last week. 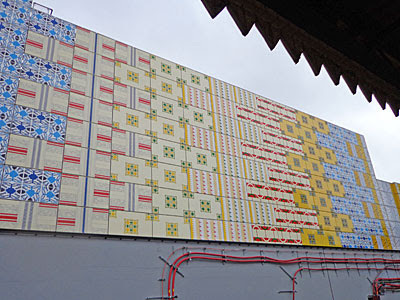 But the other 14 remain in situ, so why not take time to enjoy the enamel wrapper at Edgware Road, the tiling patterns on the Victoria line, the 'lost' segments at King's Cross St Pancras, the Shying Horse at Blackhorse Road and The Archer at East Finchley? As for that 28 page booklet, it contains this intriguing claim. "With artworks in all 33 boroughs and in every one of London's 270 Tube stations, Art on the Underground provides an opportunity for people of all backgrounds to have their lives made richer and more enjoyable through art." To assist the public in tracking down current Art on the Underground artworks, an interactive map of Current Art Projects has been created. It's well hidden, appearing only as a pop-up on the second tab of the Visiting information page, and also not entirely accurate. If you click on Notting Hill Gate you get information about Old Street, while the blob that should be at Bethnal Green has been misplaced at Mile End. Not every project that's on the Art Map appears on the interactive map, perhaps because they're not deemed current, but the end result looks rather sparse. The Visiting Information page also lists 33 stations at which "permanent artworks and temporary exhibitions" are displayed. This is a completely different list again, suggesting (for example) the presence of artworks at Covent Garden, Fulham Broadway and Waterloo but giving no clue what these might be. Each station is clickable, but this simply brings up a phenomenally detailed list of access information and nothing whatsoever about art. It's hard to judge whether this information is aimed at tube novices or the disabled - I suspect the latter, given that the advice includes "In the station the light is artificial", "Some seats have no arm rests", and "The only showers are in the Virgin first class lounge". I'd also hesitate a guess that the 33 individual Visiting Information pages have been uploaded to the internet without due care, attention and oversight. Here are 184 proofing errors I've found, in case anyone at TfL would like to employ me to help them out next time. I think that's the sloppiest set of documents I've ever seen TfL publish. Or perhaps it's just meant to be art. Afternoon update: The Visiting Information webpage and its 33 individual station subpages have been removed.